Citronello, St. Justo F. ; Estafcta Pueblo Nuevo, P'ana.ma, R.P. 1908. I worked for the Sanitary Depn.rtmncnt about the same year. 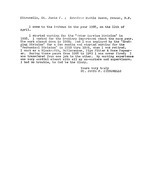 "Mechanical Division" in 1910 thru 19"t9, when I was retired. was very cordial almost with all my co-workers and supervisors. I had no trouble, to Cod be the Glory.